There has been a church in Mayfield for over a thousand years. The Domesday Survey of 1086 recorded a priest in Mayfield (Medevelde), one of only twenty-five priests recorded for the county of Staffordshire. There is now no trace of the original Church, which would have been a Saxon wooden building standing on or near to the site of the present church. 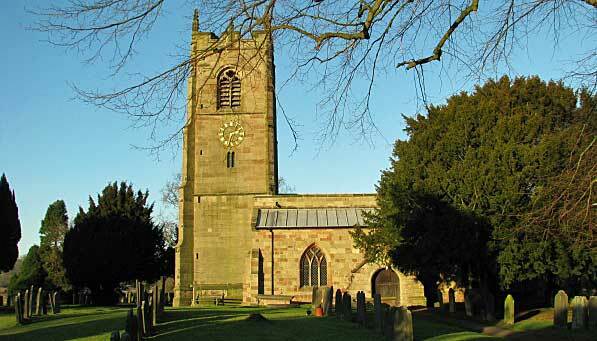 The Saxon church was replaced during the reign of Henry I by a Norman stone building in about 1125. This was a simple rectangular construction with no aisles. The church was built under the direction of the Prior of Tutbury and was probably paid for out of rents and manorial rights. It is most likely that local builders and stone masons carried out the work. During the early part of the 14th Century the church at Mayfield had fallen into a state of disrepair. A new Bishop, Roger de Norburgh (Norbury), ordered that urgent repairs be carried out. This was to prove a major and very expensive development, financed by the Rollestone family. They did this in return for land, water mills and manorial rights. Over 150 years five or six generations of Rollestones trebled the size of the nave, added the exceptionally large Decorated style chancel and, finally, the magnificent church tower built by Lord of the Manor Thomas Rollestone. This was completed in 1515. The Rollestones died out in 1587 and the last two sons, George and Henry, are buried in Mayfield churchyard. In 1538, following the dissolution of Tutbury Priory by Henry VIII, Mayfield Church was granted by the King to Sir Edward Aston. Aston in turn disposed of it to Thomas Rollestone's son James. James died and his brother Francis took over as Lord of the Manor. Francis was a friend of Mary Queen of Scots and visited her often in prison at Tutbury. He was involved in a Catholic plot to rescue Mary, arrested and sent to the Tower of London. On December 7th 1745 a section of the army of Bonnie Prince Charlie retreating from Derby passed through the churchyard terrorising the villagers who took refuge inside the church. The Young Pretender's men did not enter the church but fired several shots at the west door. The last extension to the church in 1854, principally to provide more free seats, was masterminded by the Rev Talbot Aden Ley Greaves, vicar 1851-54. As mentioned above, the Church tower was completed in 1515. A single bell was hung when the tower was completed. A second bell was added in 1642 (number 5). In 1864 a third bell was hung by Taylor's & Co. of Loughborough (Number 3). In 1902 the bells were augmented to six when the treble, number two, and the tenor were added. The final three bells were donated in memory of Joseph Simpson whose family owned the thriving cotton mill and extensive property throughout the village. The bells were re-hung in 1902 with three new bells being added to make a ring of six. The clock was installed in 1947 in memory of the Rev Dodson Tudsbury who was vicar of the parish for 28 years. Since this time there have been no more alterations to the main structure of the church. In June 2014 our font was 500 years old! To celebrate we invited everyone who had been baptised in the church to a celebratory service where the bishop re-dedicated the font and the latest member of our church was christened. After the service the font's birthday party continued outside with a fantastic birthday cake and glasses of Cava. Thank you everyone who came. More details of the history and architecture of the church are in booklet prepared by the Mayfield Heritage Group which is available inside the Church.